It’s been a little over two years since Derek brought us the news that Dr. Miller recommended patients avoid the flu shot and take vitamin D instead. This is still one of our most popular posts, so I thought it would be a good time to update our readers on the most recent information on the efficacy of Vitamin D in preventing the flu compared to the flu shot. The following is a round up of recent news on the subject. An investigation by the British Medical Journal found that many of the officials at the World Health Organisation (WHO), which was responsible for issuing the pandemic warning, had commercial ties with companies that earned billions of dollars from the sale of vaccines. WHO denies the claims. Not all experts agree on the vaccine’s benefits. Vaccines have a ‘modest effect’ in reducing flu symptoms in healthy adults and they do make it less likely that you will catch it. But they have no effect on cutting serious complications of flu such as pneumonia, which is what often kills people, according to respected research organisation the Cochrane Collaboration. Vitamin D might also be effective. Research has linked it with a wide range of benefits including improved resistance to infections. A recent Japanese trial involving 12 hospitals and more than 300 children found that those given a high dose (1,200IU) of vitamin D had nearly half the number of cases of seasonal flu compared to those on a placebo. The recommended daily amount for children is 200IU. Juzeniene A, Ma LW, Kwitniewski M, Polev GA, Lagunova Z, Dahlback A, Moan J. The seasonality of pandemic and non-pandemic influenzas: the roles of solar radiation and vitamin D. Int J Infect Dis. 2010 Oct 28. They used data from all over the world, from the last 110 years, to show that influenza death rates go up as vitamin D producing UV light goes down. Furthermore the differences were staggering, with influenza death rates 20 to 600 times higher during months when vitamin D cannot be made in the skin. While some of this is a direct “antibiotic” effect of vitamin D, some of it is likely due to vitamin D causing innate “herd immunity.” The total vitamin D “effect size” hinted at in this Norwegian paper is staggering. The vitamin D “herd immunity” effect means that if you’re the only one in your family on vitamin D, then your risk of getting the flu is lower but you still have a reasonable chance of getting the virus. If everyone in your family takes vitamin D, but no one else at your child’s school does, then your risk of being exposed and getting sick is even lower. If everyone in your town (herd) takes it then your risk is even lower, if everyone in the country, even lower, etc. This is due to the “herd immunity” effect that is well established for influenza antibodies and I hypothesize is true for vitamin D as well. Wall Street Journal: Can Vitamin D Replace Flu Shots? Vitamin D boosts immunity by stimulating production of cathelicidin, an antimicrobial protein that serves as a “natural antibiotic” in the body, says Michael Zasloff, a professor of surgery and pediatrics at Georgetown University Medical Center in Washington, D.C.
Vitamin D is generally safe, but in high doses scientists say it can pull calcium from bones, causing kidney problems and heart disease. The IOM report says vitamin D may be toxic if you take more than 10,000 IUs a day, and warns the risk of harm may begin to increase at 4,000 IUs daily. #1) It’s winter in the Northern Hemisphere, and Britain is so far north (of the equator) that the people living there aren’t currently generating any vitamin D whatsoever. This makes virtually the entire British population ridiculously vitamin D deficient throughout the winter. #2) The majority of the British population has been subjected to flu vaccines in previous years,weakeningtheir immune systems and making them more vulnerable to this year’s flu strains. #3) The flu strain itself is so successful in the wild precisely because so many Britons walk around in chronic states of immune suppression (from vitamin D deficiency, chronic stress, poor dietary habits and so on). This creates a “viral breeding ground” which encourages more rapid virus mutations that make vaccines obsolete anyway. As you can glean from the above excerpts, vitamin D is very important to our body’s immune system. Even with outdoor exposure in the winter, absorption rates from the sun between the solstices is very minimal for the Northern Hemisphere. Eating vitamin D rich foods is better than supplements, but if you are a vegetarian like me who doesn’t eat fish, this can be a challenge. I’d take a [amazon_link id=”B001G7R54K” target=”_blank” ]supplement[/amazon_link] over a vaccination any day! Interesting! We decided to not do the flu vaccines this year and are doing lots more vitamin D. Anecdotally I am not sure how we are doing compared to if we had had the vaccines, but I am glad we are giving it a try! great coverage. The IOM report was largely refuted by the vitamin D community as ridiculous. The executive council of the IOM includes representatives from the drug industry who have alot of profits to loose if vitamin D intake increases. Toxicity has never been reported below 10,000 IU per day in adults, which is a long way from the RDA of 800 IU. Blood levels are important to determine optimal blood levels. I put my patients on 50,000 IU per week (Biotech) which gives an average of 7,000 IU per day. This costs about $25 for a 2 year supply. This will not result in toxicity, which has typically required over 100,000 IU daily for an extended period. So the concern of toxicity is hyped. 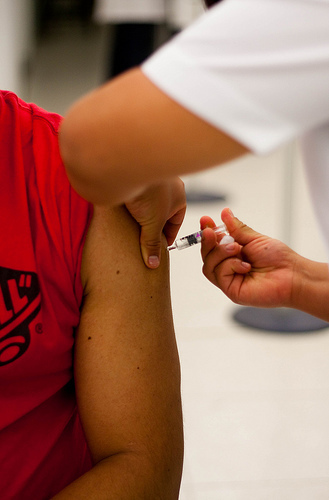 The effectiveness of the flu vaccine is marginal at best. Only about 15% of all “Flu” is related to influenza and the antigenic match is typically 50%. Therefore, the flu shot works about 7.5% AT BEST. When you factor in the risk of acute vaccine induced illness, and the long term risks of mercury exposure, you are much better off with Vitamin D. I advise boluses of 200,000 IU at the start of acute illnesses. I have yet to see complications from these doses. Despite the World Health Organization proclaiming that the pandemic is over, the current H1N1 is still a predominantly swine virus that has recently jumped to humans, and it is still causing severe and fatal infections in young and healthy and relatively healthy people (whereas normal seasonal flu rarely causes fatalities in people under 65). Dr. Miller’s article was written before the pandemic occurred and I very much doubt he would advise against vaccination now. While Americans are not currently hearing much about it, there is a flu crisis now in the U.K., probably due to the virus having evolved to a somewhat more deadly strain, which may hit here before long. The vaccine is not a perfect match and should not provide a false sense of security, but to my understanding it will definitely save lives and is worth getting. See virologist Henry Niman’s site at Recombinomics.com. I’m just glad that this information is becoming more widespread for people to see. I have only gotten one flu shot, ever, and that was the year I got the worse flu ever. Now that I depend on my immune system, I’ve never felt better. Why no mention of Dr. John Cannell from the Vitamin D Council? The Vitamin D Theory of Autism is, after all, his theory. Flu season is fast approaching and one of the best way to protect yourself from flu is to have a regular intake of dietary D3 sources.